This summer I had the opportunity to stop by a bake shoppe I had heard about while I was in school, check out my initial post on The Sweet Spot Bake Shoppe, here. One thing I love about it is that you always find the owner, Cheryl Burger at the shop working on her latest cupcake or cake pop creation and to greet new visitors. This year I had the opportunity to interview her where we discussed cupcakes, winning Cupcake Wars, and more. SCBD: When did you open The Sweet Spot Bake Shoppe? SCBD: Your cupcakes are delicious, have you always had a passion for baking? CB: I’ve always loved to bake, but never in my wildest dreams did I think I would do it for a living. 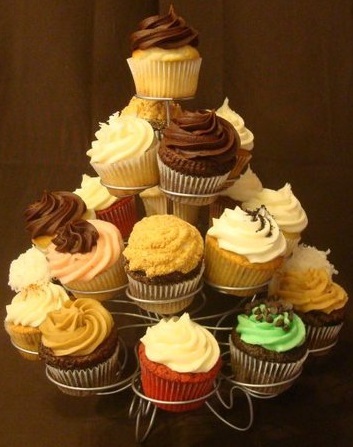 SCBD: What’s your favorite cupcake you serve at the shop? CB: Vanilla Cake with Chocolate Buttercream, simple, delicious, it’s a classic! SCBD: You are always thinking outside of the box with your flavors, what is the latest cupcake at the shop? CB: Guinness Cake with Bailey’s Buttercream is the newest addition to our cupcake family. It’s like an Irish Car Bomb, but in a cupcake! SCBD: You also have cake truffles that are great. How’d you come up with them? CB: I found them online a few years ago. They are bite sized and different. People have gone nuts for them. They are great to take to parties and during the Christmas season we shape them like Santa Hats and Christmas trees. They are so cute! SCBD: You are always doing community events, why do you feel it’s so important to be in touch and involved with the community? CB: I was raised to give back. I have volunteered for various organizations since I was a kid. To be honest, it never occurred to me not to give back. I am so fortunate to have the success I have had and I am honored to be able to share that with the community that supports me. SCBD: Owning a bake shop, you are constantly baking different cupcakes, cakes, etc for different holidays. What’s your favorite holiday to bake for? Why? CB: Christmas, without question! It’s the ultimate baking holiday! Besides all the options and great flavors that Christmas is known for, what is better than Christmas cookies?! I honestly can’t believe I get to bake Christmas cookies for a living, who could ask for anything more. 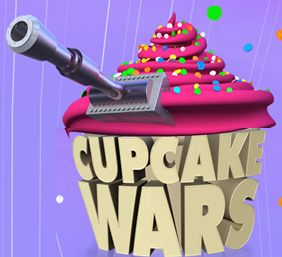 SCBD: You were on and a winner of Cupcake Wars this year. What was that experience like for you? CB: The entire experience was surreal. Just to be picked for the show is an honor, but to win is amazing! After seeing the show I went there expecting to have my cupcakes ripped apart, but the judges were so kind and had so many nice things to say about my work. I was blown away! I am dying to go back, but no word yet. SCBD: Has it affected your business for better or worst? CB: The first few weeks were great in that business was booming, but we had a really hard time keeping up with demand. We are now properly staffed and able to keep up with the increased demand, which is really my priority. More business is always great, but you don’t want to disappoint the people who have supported you since the beginning. SCBD: Have your expectations in the shop changed since you’ve won? How so? CB: I have a pretty focused goal for what I want the shop to be, what I want The Sweet Spot Bake Shoppe brand to be and how I want to grow. I don’t think Cupcake Wars changed much, except that I’m meeting growth goals on a shorter timeline than I had originally planned. SCBD: I am a young professional, what’s the best advice you got as a young professional, from who? CB: My parents were extremely supportive of this entire venture and they reminded me constantly to stop listening to everyone who tells you that you can’t do something. Not once did they question my vision or judgment. It’s unbelievable the number of people who love to share statistics about small businesses failing, or question if you are qualified to do what you are doing. Some of my own friends and family were and are skeptics. You just have to ignore it. Do what you know you’re good at and watch their jaws drop as you clear each hurdle. SCBD: What advice do you have for the young professionals out there who are looking to start their own business? CB: DO IT! I’m not going to lie and tell you it’s easy, but it is worth it. This is the time in your life that you can get away with the long hours and hectic lifestyle that comes with owning your own business. SCBD: What’s your life motto? Thank you Cheryl for giving me the opportunity to interview you. If you are in New Jersey make sure you stop by one of my favorite cupcake shops, The Sweet Spot Bake Shoppe in Chester, NJ. You’ll be in for a treat! In honor of the #SCBDAnniversary last week, The Sweet Spot Bake Shoppe has agreed to do a cake pop giveaway! Want to enter? It’s easy just become a fan of Small Chick Big Deals on Facebook and our 200th fan wins a dozen! This entry was posted in Cheryl Burger, cupcakes, Interview, Jersey Girl, New Jersey, nj, Sara Monica, SCBD, SCBDExclusive, Small Chick Big Deals and tagged cheryl burger, cupcakes, exclusive, interview, nj, scbd, small chick big deals, sweet spot bake shoppe by smallchickbigdeals. Bookmark the permalink. She didn’t think outside of the box for the Guinness Car Bomb cupcake. The recipe has been online forever. I made them a few years ago for everyone in my office. She didn’t come up with the idea on her own.